PCA hack CBI Through The Creation Of Proxy Server from Other Three Countries !! The research on hacking the website of the IWC by the Pakistan Army Cyber (PCA) revealed that Islamabad were able to overcome the first line by creating proxy servers. CBI has traced these servers in Pakistan, United States (California), Indonesia (Jakarta) and Latvia. 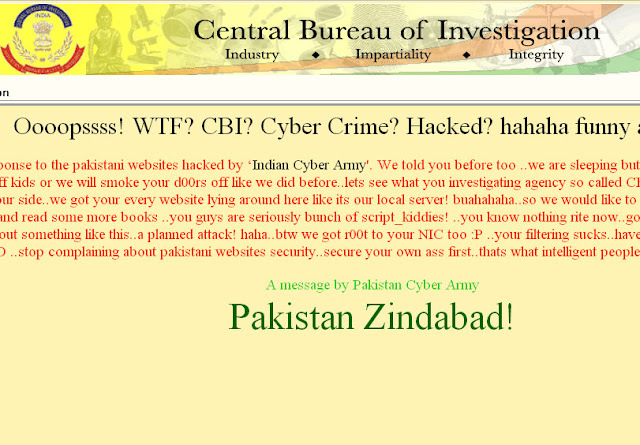 CBI source said, "the IP addresses shows that the CBI, the site was hacked in Pakistan. However, baffles scientists Pakistan created the three proxy servers in three other countries." Investigators believe that the Pakistani intelligence service ISI, played a major role in the hacking site IWC. Agency, which has registered a complaint against piracy, December 5, is now sending letter rogatory (LRS) of these four countries for information on servers and creators of IP addresses. CBI site, linked to the Interpol database of criminals, was restored a week ago by the National Informatics Centre (NIC). PCA hacked the site on December 3, hacking revenge 36 portals of Indian Cyber Pakistani Army on November 26. "Pakistan CBI hack site, because they argued that the anniversary of 26 / 11 attacks, their websites were hacked by Cyber Indian Army. Also on the left after the CBI hacking site, that" India should think the safety of their websites, "the official said. Pakistan polls suggest that CBI was created in the proxy servers on the floor or the people in these four countries have developed. "RV ship these countries know the details," said a source. ACC PK described as predators who claims to have hacked 200 sites in India, including the CBI, NGOs, private and religious organizations, according to the Pakistani daily, La Tribune de L'Express, in December. "They have developed pages and then inserted into the Indian servers and websites on the root level," said a CBI official. APC has also left a message on the ICC website at the time of piracy: "It's just a warning to all the" script kiddies "Stop being hackers no0bs makeup sites in India and Pakistan Your security is good, but we like to break ..!